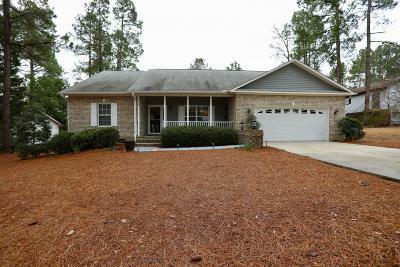 Come live the Good Life in this beautiful turn-key 3/2 golf front home in desirable 7 LakesSouth. This split plan ranch style home sits on over a half acre and is located on the 1stfairway of 7 Lakes Golf Club. Built in 2006 and remodeled in 2017 with new ''wood-look'' tile floors in the great room (living room/kitchen/dining room),Berber carpets with upgraded padding in all the bedrooms and closets, fresh paint andbeautiful granite surround fireplace. The master bath was also remodeled. The largewalk-in shower has floor to ceiling tiles with glass accent tile and a marble top double sinkvanity with glass accent tile backsplash. There is an oversized soaking tub with a glassblock window.Enjoy the back deck and patio. All landowners have access to all association amenities.